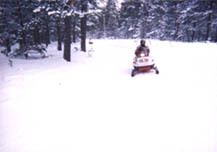 Michigan Snowmobilers enjoy approximately 6,000 miles of designated trails throughout the state. The trails are popular with Michigan residents and many out of state residents make their annual trip to the Great Lake State to enjoy some of the finest snowmobiling in the country. No matter where you live in Michigan, you are only a short drive away to the trail system. Snowmobilers must register their machines wih the Secretary of State. The registration is good for 3 years and costs $22.00. State law requires that you affix the registration decals issued to the snowmobile to each side of the forward half of the cowl above the footwell. Who's the King of the Sleds? Who do you think makes the most dependable snowmobile today? automatically be entered to win a subscription to Snowgoer magazine.